The riots in Berkeley should put to rest the idea that criticizing Antifa creates a false 'moral equivalence' between the violent left and the violent right. 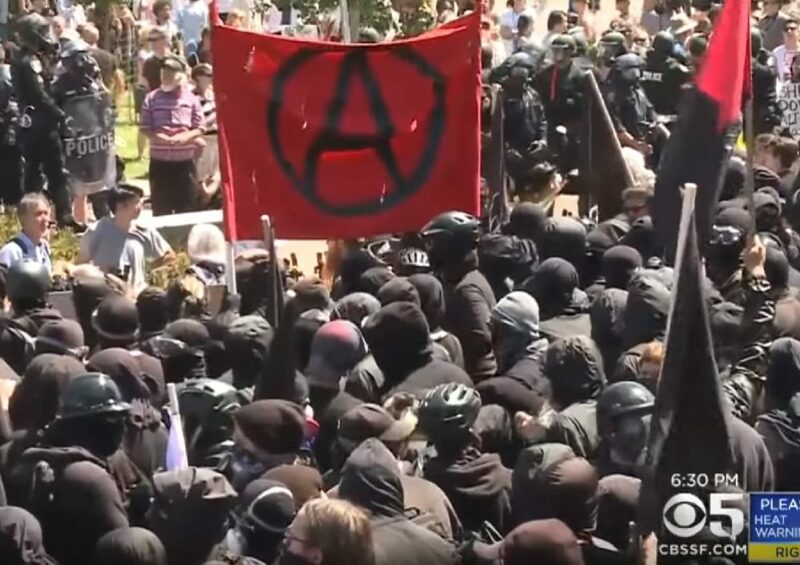 The media spent the last two weeks, after the deadly riot in Charlottesville, denouncing the notion that there were two sides responsible for the violence and specifically praising the far-left’s black-clad “Antifa” brawlers as freedom fighters who are saving us from Nazism. Then, on Sunday, Antifa was filmed attacking random people on the campus of the University of California at Berkeley, looking and acting exactly like a fascist militia bent on imposing rule by force. This is a timely warning that the media is using the shock and horror of one evil, a newly brazen white nationalism, to panic us into submission to the horror of another evil. This media trope was established by criticism of President Trump for condemning violence on “both sides” in Charlottesville. Since anything Trump says must necessarily be wrong, it therefore became unacceptable for anyone to say that there was violence on both sides in Charlottesville. But there was violence on both sides. That was clear from videos and photo essays and was described by reporters at the time. That even includes reporters who, in the process of factually describing the violence on both sides, still imposed the narrative that both sides weren’t to blame. For example, New York Times reporter Sheryl Gay Stolberg acknowledged the “hatred” with which the black-clad Antifa attacked their opponents, but then the Twitter mob pressured her to recant. In the old days, we used to speculate that reporters and commentators tailored their views based on what they thought would get them invited to DC and New York cocktail parties. Now they tailor their views to avoid the amplified gossip of random people on a social media platform. Decide for yourself which is worse. But the new edict had been delivered by the vox populi of political Twitter, and everyone fell in line. The Left has given up violence, having “cleansed itself through a painful process of introspection,” according to an opinion piece in the Washington Post. Even if they are violent, it’s just not the same thing, because they’re not motivated by “hate” when they club people over the head. They’re violent in a good way, and only against the bad guys. In fact, come to think of it, they’re just like the GIs who stormed Omaha Beach! No, really, this actually became a meme, the most famous version of which came from The Atlantic‘s Jeffrey Goldberg. Watching ‘Saving Private Ryan,’ a movie about a group of very aggressive alt-left protesters invading a beach without a permit. Funny, I must have missed the part in “Saving Private Ryan” where Tom Hanks’s character is a radical socialist. Maybe it’s in the director’s cut. After the media worked so hard to establish this new dogma, Antifa thugs repaid their courtesies by staging what can only be described as a violent takeover of the Berkeley campus. Ostensibly this was in response to a “No to Marxism in America” rally that never even happened. But it didn’t matter whether it happened Antifa used it as an excuse to attack any passersby suspected of being white nationalists or merely conservatives or Trump supporters. Notice the black man rushing in to cover the body of the man being beaten on the ground, protecting him from Antifa—which undermines the whole narrative about how they’re protecting black people from racists. Some of us have long warned that college campuses are becoming like one-party dictatorships, intolerant of any opinions or culture the Left oopposes. But up to now, this cloying monoculture has largely been accepted and enforced through voluntary means. They chose conformity. Now the universities are becoming literal pockets of totalitarian rule—zones in which those with dissenting political opinions face the prospect of being beaten by an angry mob. Actually, it’s more anarchic than that. The Antifa mobs weren’t stopping people to interrogate them about their political opinions. In one video a middle-aged man and his college-aged son are being attacked, and he starts by asking, in a bewildered tone, “What are you guys beating us up for?” The only answer he gets is a fist in the face, and that’s the only answer any of us are liable to get when Antifa comes for us. That’s what gives Antifa the genuine stamp of a totalitarian movement. They have gone from attacking “fascists” to attacking anyone who is not them, anyone who is not a member of the party. Vox took a peculiar middle path, declaring that beating up political opponents is bad, but not because it’s repellent in and of itself. It’s bad because it could lead to bad publicity: “such violence can reinforce right-wing views about the left.” Imagine that. But others are digging deeper. A prominent leftist writer and television host who just goes by the name Touré is still hailing Antifa as heroes. If white supremacists are American terrorists then those willing to physically fight them are doing heroic work. One of the mysteries of Antifa is that it’s hard to say exactly what their wider program is. They are communists, but in an old tradition of the anarchist left. In practice that means—well, it’s what you see in these videos. It’s what someone once called anarcho-totalitarianism. It is lust for power in its most elemental form: beating self-designated “enemies” as an end in itself, for the thrill of exercising physical power and coercion directly on the body of another person. It is how George Orwell described the steady state of the perfect totalitarian system: a boot stamping on a human face, forever. Conventional liberals have toyed with a similar motive in a much more diluted and genteel form. They have indulged in the ritual of casting everyone who disagrees with them as a racist and fascist in order to establish their own sense of moral authority by comparison. What they haven’t figured out yet is that this seemingly benign thrill of self-congratulation is just a weaker form of the same impulse, a diluted form of the lust for power. It starts with enjoying being part of a social-media mob that gets some guy fired from his job or forces some other guy into a groveling public apology in order to enjoy one’s own sense of power and authority as the imposer of these humiliations. But if you keep indulging this impulse, it ends with seeking the sense of control over others that comes from smashing your fist into someone’s face. But the riots in Berkeley should put to rest the idea that criticizing Antifa creates a false “moral equivalence” between the violent left and the violent right. It does create such an equivalence, but it’s not false. In the past century, that was established so thoroughly that it can be encapsulated in a single meme. For the benefit of college students, the guy in that photo is Joseph Stalin. He was the Communist dictator of the Soviet Union and a member of the violent “anti-fascist” left, and he imprisoned, tortured, and murdered at least as many innocent people as Hitler did. To those on the moderate left, I know that you don’t want to give up on the dream of socialism. But how many times does that dream have to turn into a nightmare before you start to question it? The events of the past week—exaggerated praise and water-carrying for Antifa, followed by clear evidence that it really stands for terror and oppression—is a re-enactment in miniature of the cultural elite’s fascination with Communism during the twentieth century. Don’t be one of the bitter clingers who need to learn that lesson in much more horrifying form before you finally see the truth. White nationalism and Antifa are both assaults on freedom and American values. They are both violent movements that ultimately seek rule by force as an end in itself. They are moral equivalents, and if we want to save our civilization, we have to stand firm—and stand together—against both illiberal sides.